I know there's be a couple of instances of bad parking in the rubbish driving thread. But there really is no other way to describe what I experienced when returning to my bike. 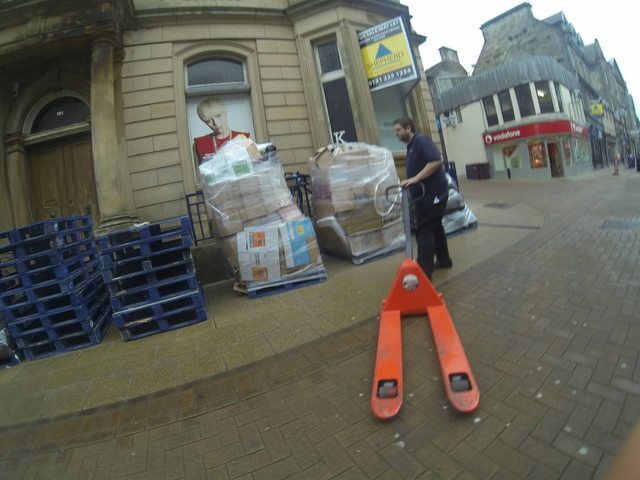 So poundland your rubbish parking is well ... rubbish. To give them their due they were quite apologetic when I asked them to move it so that I could get to my bike. 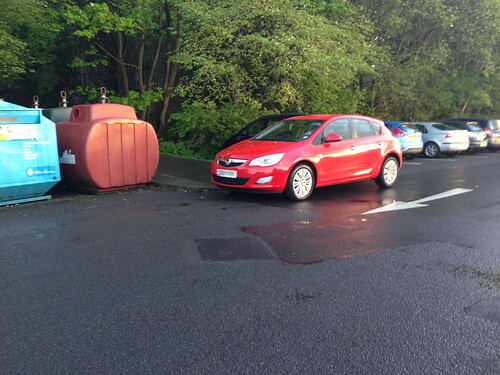 I came across this car "parked" at the end of the cycle path at Ainslie Park yesterday. If only Danny Macaskill could be there to hop onto the roof and bounce his back wheel from end to end. I hope he was wearing a helmet. What if he fell? I often have this wonderful dream of riding around on a traditional Dutch bakfiets - the sort with a 3000+kg load platform and 2 front wheels which would not look out of place in the front forks of a moped. I've ridden a 1920's fixed wheel model, which was wonderfully free-rolling, but once you got the momentum up it was a real bind to actually use the brakes (which I suspect the makers realised and thus made them suitably inefficient). The guy in the lorry (I forgot to make a mental note of the construction company) which was parked outside the north gate of Heriot-Watt campus this morning, blocking the bus-stop and the pedestrian island crossing in one. Pushing my bike around the front of his lorry, I waved and indicated that he was blocking the crossing. I think he started ranting back at me, but I couldn't hear since his windows were up. At least he wasn't engrossed doing whatever non-driving he was doing whilst also driving. Half the cars on Albert Street, Leith Walk end. Doubke parked, pavement parked, you name it. Every day. Without fail. That CEC vehicle is parked! Cars parked on the footway crushed by wall collapse. I hope his insurance refuses to pay out. I'm not sure I would wish someone to loose their cars like that but if you locked your bike in the wrong place your insurance wouldn't pay. I suspect if the insurance doesn't pay that the council or whoever is responsible for the flood prevention would. "or whoever is responsible for the flood prevention"
This morning it was the 40-foot lorry parked on Gogar Station Road, on a double yellow, on a bend, blocking not only the cycle lane but half the entire width of the whole road, while the driver appeared to be having a cuppa. Well done, sir, you are an utter chump. Sadly I was bereft of cameras - phone was out of juice and I'd left the Virb off since it's pointless in the rain. There was a lorry parked on York Place westbound this morning, beside the tram stop and possibly over a bus stop, just before the ped crossing to the tram stop. A bus, finding the stop blocked, stopped alongside the lorry, letting passengers out (and taking them on) from the right-hand lane. “We’ve gone through years of hell with this flood prevention scheme and to find it doesn’t work is just gutting. All that hard work. This shouldn’t be allowed to happen. 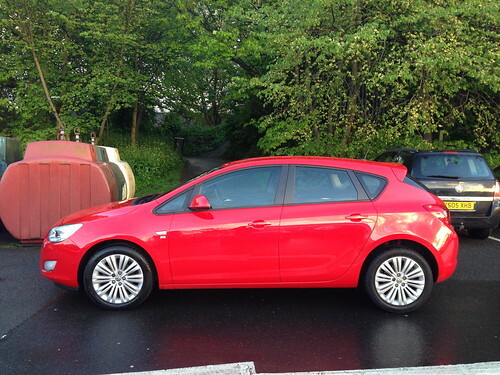 "A spokesperson for Fife Council confirmed that there are double yellow lines and kerb markings in this area that indicate no waiting, no loading at any time." It that is the rules in Fife why is it so hard for Edinburgh to enforce it? The comments on that Dunfie Press article are remarkably sane. How come the EEN attracts such a bunch of rockets? Haha! Brilliant! Lured into their trap, just like all those speeders. It is astonishing how many otherwise sane, reasonable people in Edinburgh seem to think it is acceptable to park on double yellows. I thought it was a society going to the dogs things, but maybe it's just a localised Edinburgh issue? Would be great to see double yellows enforced here. An enforcer stationed within sight of HSBC in Hanover Street would pay for him/herself three or four times over, I reckon. The one place I have seen 'blitzed' for DY parking/loading is outside the Roxburghe Hotel, and not before time, a lot of irate coach & taxi drivers that morning. On blue badge holders, I wonder how many actually know the rules (eg can park on single or double yellows for up to 3 hrs provided loading allowed). A lot I see seem to reckon it's carte blanche (bleue?) to park where they fancy for as long as they like. There's one at the west end of London St which is on DYs 24/7, rarely moves but never gets a ticket - I reckon just avoiding having to spring for a parking permit. It's even on Google Streetview. I mean no disrepect to those for whom BBs are vital - in fact they should be more upset about abuse of the system than anyone. I often wonder if it's an Edinburgh "thing" that DYL parking is OK, so long as >50% of your vehicle is on the pavement. It seems to be a relatively new, but wholly common occurrence. As Murun B points out the comments on the Dunfermline Press article are the polar opposite to what you'd get from the same article in the Edinburgh Chipwrapper. So it appears there's something engrained in the Edinburgh psyche that makes bad parking so prevalent here. Oh, I know this one. It's a wee bit dented and bashed up as well - I often wonder if it's got that through parking at places which have been designated double yellow because they are not safe places to park. 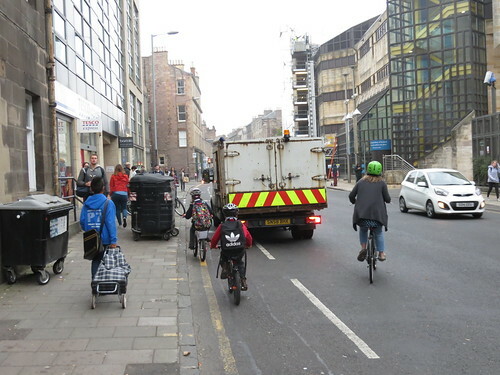 It can make cycling round that corner or crossing on foot a slightly hairier experience than it needs to be, especially as it is rarely parked as close to the actual permitted parking spaces as it could be. Often it's in the middle of the DYs. @Luath I use the Coal Road frequently and the pictures don't really show it but that 'pavement' doesn't go or lead from anywhere as it blends into the road and at the other end is the junction with Pittencrief Park. As such peds don't use it at all. The two MX5s have sat there for years and never moved. Not saying it's right they're parked on the pavement but in this rare case I'd say the only people who would use it are the owners of the car! It's quite risky obstructing a pavement with your car. Passing prams and bicycle handlebars can cause terrible damage. "On blue badge holders, I wonder how many actually know the rules (eg can park on single or double yellows for up to 3 hrs provided loading allowed). A lot I see seem to reckon it's carte blanche (bleue?) to park where they fancy for as long as they like. " hadn't realised it is 'up to 3 hours'. there's one that parks on corner polwarth gardens/harden place 24/7, even when there are spots in the residents bays and/or nearby blue badge bays. drives me crazy. wardens won't ticket it. may ask them about the 3 hour rule next time I see them.